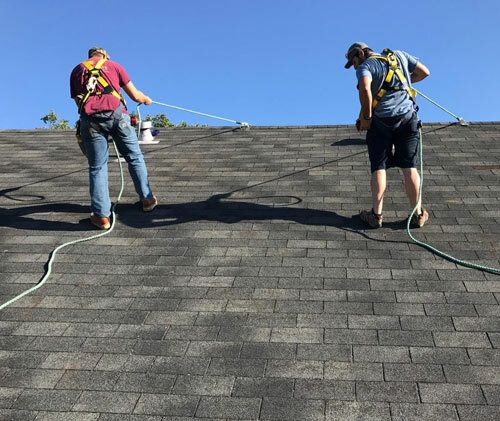 Two team members wearing safety harnesses preparing to lay out the mounts for the solar panel installation. Synergy Solar is different from many solar companies in several main areas. Synergy Solar owners Mike and Jeff are actively involved with each customer, from the initial sales consultation, through the installation and post installation phases. Synergy Solar not only has a C46 solar license, but also a C10 electrical license, so we do not need to sub-contract our electrical work. Synergy Solar was the first solar company to become NABCEP (leader in solar PV) Accredited in the North Bay. Our focus is on the system value, throughout its useful life, not just on the initial cost. Synergy Solar installs systems in Sonoma County exclusively; we know the local weather patterns to maximize production; we know the inspectors and their requirements; and we live here and are committed to Sonoma County. At Synergy Solar we sell best of class, American made products, that will operate well today and into the future. Why Synergy Solar? We focus on customer satisfaction. Our customers say it best, read their testimonials. 20 Year commitment to the solar industry.